Several weeks ago, Jim Campi, Civil War Trust (CWT) policy communications director called Clyde Cristman, director of the Virginia Department of Conservation and Recreation (DCR), with a proposal to turn CWT-owned battlefield property at the Brandy Station and Cedar Mountain into state parks. However, Cristman told Campi that he needed to float the idea to some members the Virginia General Assembly, which determines appropriations and priorities within DCR. Establishing new state parks hasn’t fared well recently in the General Assembly. Del. Ed Scott (R-30th), who sits on the House Appropriations Committee, said what appears to be a simple idea is actually very complex. Culpeper’s two major battlefields could add to that undeveloped inventory. “All conversations have been very preliminary, since many details would need to be considered and addressed,” Campi said in an email. However, Cristman said establishing a Civil War battlefield park in Culpeper County would fill a void of state parks in close proximity. Looking at the DCR website of existing state parks, Culpeper County sits in the middle of a large blank spot, with no nearby state parks. “This would be unique in that it would be a new state park,” said Cristman about CWT’s overture for Culpeper state parks. CWT purchased property before adjacent to existing preserved battlefields and donated the land to the federal government and the state. Some of those transfers were donated and some sold to the state, according to Campi, with sales proceeds plowed back into preservation efforts elsewhere in Virginia. 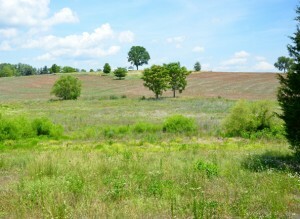 About 73 percent of the Sailor’s Creek Battlefield was preserved by CWT. If the General Assembly agreed to establish another Civil War-focused battlefield state park, it would be years away. The state would have to conduct federal and state mandated studies. At the Brandy Station Battlefield, some of the core battlefield still remains privately owned, creating a patchwork of preserved land versus privately owned land. Several significant private tracts abut Fleetwood Hill, which was purchased and preserved by CWT. The Trust owns 1,901 of the Brandy Station Battlefield. The Brandy Station Foundation owns 38 acres at the foot of Fleetwood Hill, along with the Graffiti House that served as a hospital during the Civil War. Troops from both sides scribbled names and drew pictures on the walls, which has been uncovered and preserved. “Regardless of whether the state park idea has any legs, the Trust remains committed to preserving battlefield land at Brandy Station and Cedar Mountain,” Campi wrote. DCR Director Cristman said a number of issues must be considered before determining the funding needed, such as how and where it would operate. If the General Assembly liked and funded the idea, it could take years for a Civil War park to open in Culpeper. Before a new park opens, DCR partners with local government and the community to determine how the park operates and services offered. Read believes the creation of a state park would be a boon to tourism in the county. Plus, she added, Virginia nationally markets its park system. State parks experienced almost 9 million visitors last year, an increase of 1.4 percent from 2013, said Read. “State parks are tremendous,” said Read, noting Virginia maintains 36 state parks. She said that every dollar spent by the general fund generates $12 for the local economy. Noted local Brandy Station Battlefield historian and a founding member of the Brandy Station Foundation Bud Hall is optimistic that the historic cavalry battlefield will become a state park. There’s an old cliche that says that those with weak stomachs should never watch either sausage or legislation being made, because neither is a very pretty sight. The process of creating this state battlefield park will neither be quick nor will it be pretty. But it needs to happen, and we need your support in order to help to ensure that it happens. If you support this initiative, please write to the newspaper editors to express your support, and please write to the Virginia assemblymen to express your support. Thank you for supporting our efforts to preserve these battlefields. On May 28, I posted here that the time had come for the creation of a Virginia state Civil War battlefield park in Culpeper County. The idea is catching on, and we need your help to make it happen. If the stars align, Culpeper County could be the home of a new state park. State and local officials are tossing around the idea of creating a park to preserve and spotlight Culpeper’s two most significant Civil War battlefields—Brandy Station and Cedar Mountain. Clyde Cristman, director of the Virginia Department of Conservation and Recreation, confirmed this week that there have been “very preliminary” discussions about the proposal. To become a reality, a park “would have to have support from the local government, local General Assembly members and a majority of the assembly,” Cristman said in an interview. His department already runs parks focused on Civil War sites at Sailor’s Creek, High Bridge and Staunton River. Joe McKinney, president of the Brandy Station Foundation, said he has heard that Gov. Terry McAuliffe is interested in the idea. “The state park system has the resources to protect these battlefields here in Culpeper and draw more people interested in history to come see them,” McKinney said in an interview. The foundation, a nonprofit group that owns 38 acres near Fleetwood Hill—heart of the 1863 cavalry battlefield—supports the idea, though McKinney noted that there will be many nuts-and-bolts details to sort out. He said he thinks the foundation’s Graffiti House, an antebellum home in the village of Brandy Station, could serve as a visitor center for the park. The foundation and another nonprofit, Friends of Cedar Mountain, maintain battlefield land as living memorials to the men who fought and died there. Culpeper Supervisor Steve Walker, who operates Fountain Hall bed-and-breakfast, supports the park notion. “I think it would be a very positive thing for Culpeper, definitely helping to develop more tourism opportunities,” Walker said. “My only concern is when the state got involved, whether it would restrict farmers or hunters. Culpeper Supervisor Bill Chase also favors the idea. The Civil War Trust, which preserves 1,901 acres of the Brandy Station battlefield and 164 acres at Cedar Mountain, likes the state-park thought. Campi declined to comment on the national nonprofit group’s discussions with state officials, other than to describe them as preliminary and productive. 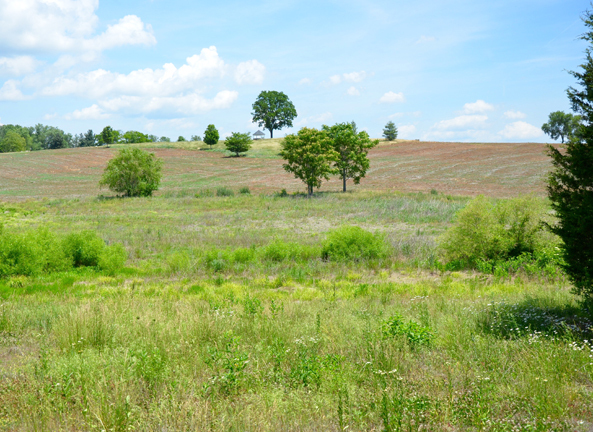 Glenn Stach, a preservation landscape architect in Warrenton, said the Virginia Outdoors Plan, a long-range planning document, identifies the region between Sky Meadows State Park in Fauquier County and the Rapidan and Rappahannock rivers as one without a state park. “It’s been on the radar for quite some time as an opportunity, with an underserved population in the vicinity,” Stach said. The McAuliffe administration is identifying places to create new parks for the 80th anniversary of the state park system next year, Stach said. Diane Logan, president of the Friends of Cedar Mountain, said the Culpeper nonprofit strongly supports the concept of a state park and sees it as a economic development opportunity. If the park happens, the Cedar Mountain battlefield would be promoted in state literature and its tourism efforts, she said. Virginia historian Clark B. Hall, who has spent decades working to preserve Brandy Station from development threats, said the park would focus national attention on Culpeper. Fought on June 9, 1863, the Battle of Brandy Station opened Confederate Gen. Robert E. Lee’s Gettysburg Campaign and proved the mettle of Union cavalry. 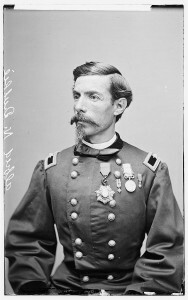 Paul Hawke, chief of the National Park Service’s American Battlefields Protection Program, was also enthusiastic. “This is an excellent opportunity to save, and open to the public, two important Civil War battlefields that have long been overlooked,” he said. The park idea has been talked of by some local residents for a long time, since at least 2000. But a keystone fell into place in 2013 when the Civil War Trust bought the southern crest of Fleetwood Hill, site of Confederate Gen. J.E.B. Stuart’s headquarters before the battle, and several other properties associated with the famous ridge, Campi said. “We needed to have Fleetwood Hill because it was the epicenter of the battle, the jewel of Brandy Station,” he said. We need your help to make this happen! If you support this initiative, please write letters of support to the editor of the Free Lance Star and to legislators in Virginia. Now is the time. 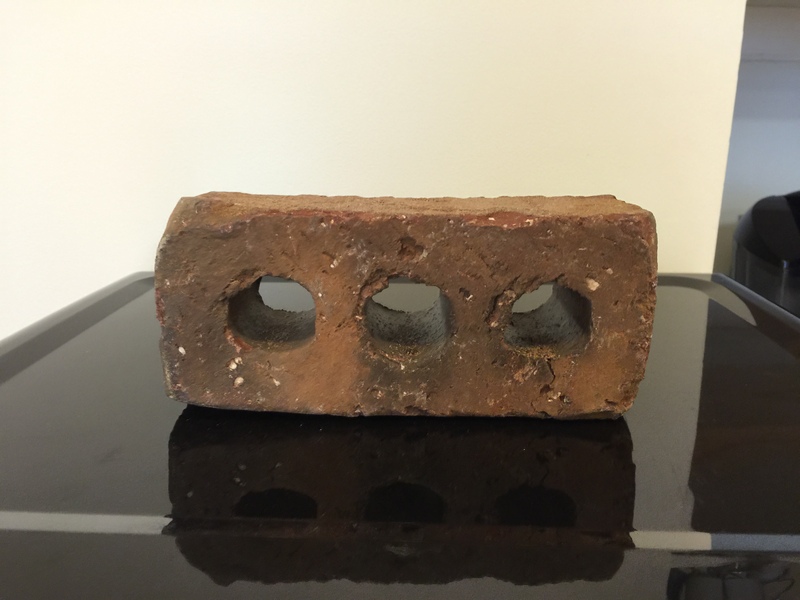 Not just any old brick…. A nifty gift just arrived in the mail from my friends at the Civil War Trust. It’s a brick. And I’m thrilled to have it. You might ask, why? What’s so exciting about a brick? This brick comes from Tony Troilo’s McMansion that blighted Fleetwood Hill for far too long. When the house was demolished, I asked that the Trust save me a single brick from the house as a souvenir of the fight to save Fleetwood Hill, and this is that brick. I have the perfect place for it in my home office, and every time that I look at it, I will smile, because of what it means. Its presence in my home office means that the McMansion no longer blights Fleetwood Hill, and that the view from Fleetwood Hill is once more unfettered. So, you see, this is not just some ordinary brick. It’s a very special brick, bought and paid for by the blood of the soldiers who fought, bled, and died on Fleetwood Hill, and by the folks who donated the money to make the acquisition and demolition of the McMansion on Fleetwood Hill possible. And because it’s a very special brick, it will forever occupy a special place in my heart and in my home office. With many thanks to Clark B. “Bud” Hall, who not only provided me with these two images, Bud was also the one who identified the historic image as being of Fleetwood Hill when it had been mislabeled for years as being a camp in other locales. The view is north, and this is the attack perspective of the 1st Maryland Cavalry as Wyndham’s Brigade attacked Fleetwood on June 9. The house was “Fleetwood,” built in the 1700’s by John Strode, and was in 1863 the tenant home of farmer Henry Miller. 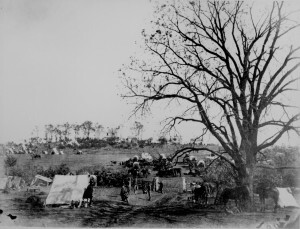 The fruit orchard visible in the ’63 image was destroyed (for firewood) during the winter encampment of the Army of the Potomac, 63-64. During that winter, the Miller home would be the headquarters of Maj. Gen. William French, 3rd Corps. The road in the center of the ’63 image is easily discernible today as it leads to Brandy Station Station, a half mile away, and behind the photographer. The modern image was taken on June 1, and is exactly the same view and perspective. The small structure that looks like a gazebo is the historic well on the crest of Fleetwood Hill, which is enclosed to prevent folks from falling in. It bears repeating that the view of Fleetwood Hill, unfettered by the McMansion on the hill, is a thing of beauty to be treasured. To see larger versions of either of these two images, please click on them. With many thanks to Dave Roth, the publisher, for giving me permission to reprint it here, here is Rob Grandchamp’s extraordinary review of “The Devil’s to Pay”: John Buford at Gettysburg. A History and Walking Tour that appears in the current issue of Blue & Gray Magazine. I’m humbled by such a wonderful review, which is the finest review any of my books has ever gotten. Award winning historian Eric Wittenberg, who has had a lifelong fascination with Union General John Buford, has researched and authored this tome. It combines the sharp research and intellect that he brings to his work, extensive use of primary manuscript sources, as well as the maps and images that Savas Beatie’s works are known for. Wittenberg begins with a brief biography of Buford and an overview of his First Cavalry Division. The book is heavily illustrated with photographs, and includes many never before seen images. In addition, highly detailed maps throughout the text show the position of Buford’s men in this battle. 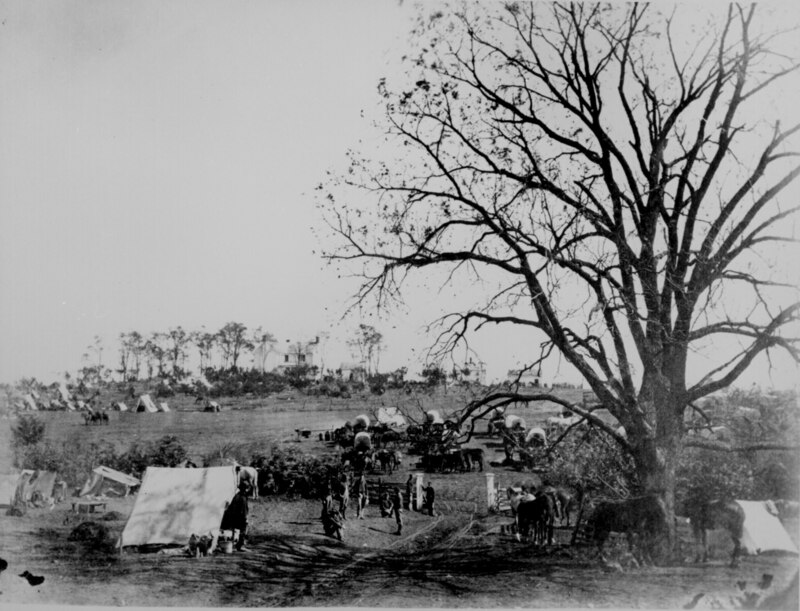 Arriving in Gettysburg on June 30, 1863 Buford carefully surveyed the ground and determined to hold a series of ridges west of the town in order to delay the Confederates and allow the Union infantry to get into position. Wittenberg notes that Buford’s tactics on the morning of July 1 are still taught to cadets at West Point as a classic example of the use of cavalry (now replaced with wheeled vehicles, but still employing the same concepts). 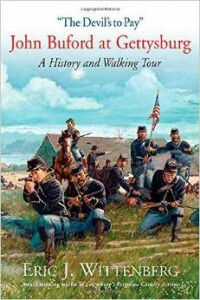 Much of the book covers Buford’s actions on the first day at Gettysburg. Through a series of breakdowns in Confederate leadership, and with superb use of the terrain and their breechloading carbines, the eight regiments of Buford’s command were able to hold the ground against an overwhelming Confederate offensive. The descriptions of this action are the most detailed and descriptive this reviewer has ever seen. The maps highlight the action, allowing the reader to view the text down to the company and regimental level. In addition, the well placed footnotes allow for further serious scholarship. It is evident that Wittenberg has done his homework, as the book contains many sources not previously seen by historians. Buford’s men held their positions until the I Corps arrived on the field, and continued to support General John Reynolds’ flanks until the corps retreated back to Gettysburg. While most books that narrate the story of Buford’s men at Gettysburg end with his division being relieved at the end of the First Day, this book does not. On the morning of July 2, one of the brigades supported the 1st U.S. Sharpshooters and the 3rd Maine in a reconnaissance in force near Pitzer’s Woods on Seminary Ridge. This engagement is often overlooked, but Wittenberg provides a detailed overview of the brief fight at Pitzer’s Woods, which was the opening of the battle on the southern part of the line on the Second Day. After this engagement, army commander General George G. Meade wisely sent Buford’s worn out division back to Westminster, Maryland to guard the supply train and refit. 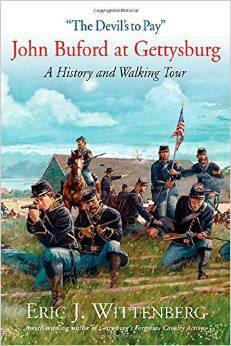 The main part of the book ends with a historiography of Buford’s legacy and his role at Gettysburg. Several important appendices are also present, including one on the Buford monument at Gettysburg, a driving tour of positions associated with Buford’s command, and a discussion about the long held thought that Buford’s men were armed with Spencer repeaters, rather than single-shot breechloading carbines, at Gettysburg. Wittenberg, through deep research, has finally determined that the command was not armed with Spencers until the fall, and that Buford’s eight regiments carried a miscellaneous assortment of carbines. In conclusion, this book is typical of what we have come to expect from Wittenberg: meticulously researched, superbly illustrated, and well written. While many books have been written about the early morning fighting at Gettysburg on July 1, 1963, this is the first book that has focused solely on the very important role that John Buford and his First Cavalry Division played in the fighting. While often an unsung hero of the battle, this book has brought Buford’s role in the action back to life. It is one of the better books to come out of the Civil War Sesquicentennial. “The Devil’s to Pay” is an exceptional read and must-add to any Civil War collection. It simply does not get any better than that, I am very grateful to Rob for his incredibly kind words about my labor of love. That is, without question, the single best review one of my works has ever received. I do need to correct Rob’s statement about when Buford’s command might have been armed with Spencer repeaters. 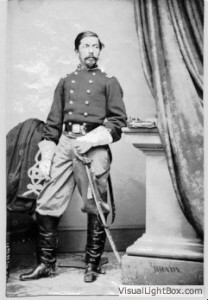 Rob incorrectly states that the First Cavalry Division was armed with Spencer carbines in the fall of 1863. The Spencer carbine only went into mass production in September 1863, and there were not sufficient quantities of them available to distribute until the winter of 1863-1864. When the Army of the Potomac’s Cavalry Corps took the field in the spring of 1864, it was largely armed with Spencers, but not before that time. How Fleetwood Hill looks today…. 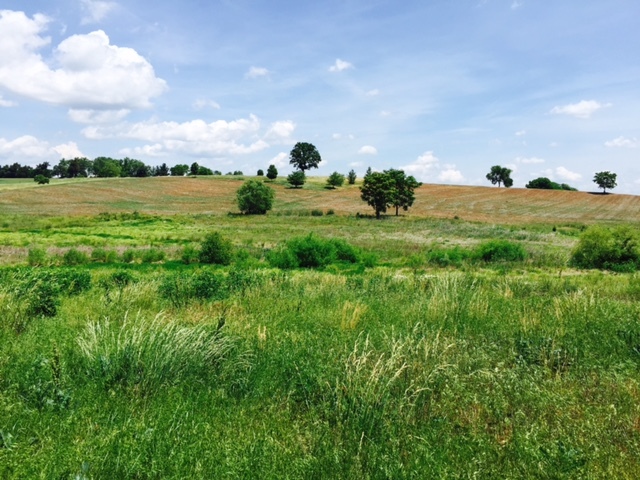 Here is how Fleetwood Hill looks today, June 1, 2015. This view is taken from the Flat Run Valley, to the south of where Lake Troilo once sat. Thank you to all of you who made this view possible–and especially to Bud Hall, the Civil War Trust, and those of you who made large donations to make it possible, and thank you to Tony Troilo for deciding to violate federal law. No thanks are appropriate for, nor should they be given to, Useless Joe McKinney and the Board of Appeasers, who idly sat by and let it happen in the hope of not offending Useless Joe’s pal, Mr. Troilo. Fleetwood Hill–the single most fought-over piece of ground in North America–is once more unfettered. For a full-sized view, click on the image. Thanks to Clark B. “Bud” Hall for sending it along.